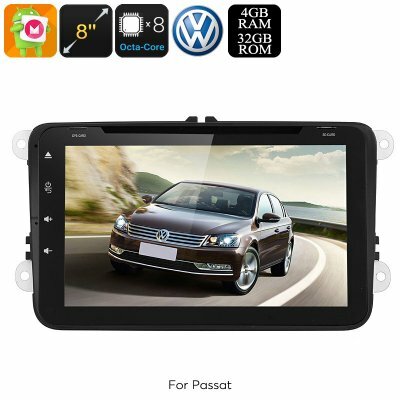 Successfully Added Dual-DIN Car Media Player - For Volkswagen Passat, Android 8.0.1, WiFi, GPS, CAN BUS, Octa-Core, 4GB RAM, HD Display, DVD to your Shopping Cart. With this Dual-DIN car stereo for your Volkswagen Passat, you’ll bring great convenience and joy into your vehicle. By supporting both FM and AM radio frequencies, it allows you to listen to a vast number of radio channels. Additionally, this two DIN media player supports MP3 and MP4 files as well as Bluetooth. The latter lets you sync your car stereo with your smartphone or tablet so that you can enjoy your mobile music library while cruising down the streets. With its four 45W speakers, it will treat you to great quality audio at any time. From now on, you’ll always be able to listen to your favorite tracks and talk shows. Thanks to its built-in microphone, it even lets you make hands-free calls. Besides bringing music into your life, this car media player comes with a 20-channel GPS navigation system. With this tool in place, you’ll always be able to find the fastest route to your upcoming destination. Simply insert the Android map of your liking, and this GPS will treat you with highly accurate traffic information of your area. With its 32GB SD card slot, your 2 DIN car stereo holds plenty of space to insert Android maps, games, and other sorts of media. By running on an Android 8.0 OS, this car media player brings along great entertainment possibilities. Your passengers will be able to watch series, movies, and play games on a beautiful HD display. Additionally, your car accessory also supports WiFi. Not only does this allow you to download files, it also lets you stay connected to friends and family no matter where you’re headed. Head out to the Play Store for the latest Apps or stream movies online. Nothing is too much for this Android media player. Thanks its Octa-Core CPU and 4GB RAM, this car stereo handles all.